Spend 5 minutes with Jean Shapiro and you’ll understand why hundreds of parents around metro-Atlanta bring their children to her Dance & Arts Showcase studio every year. From the time she was a baby, Ms. Shapiro’s life has revolved around dance. Her mother, one of the original members of the Atlanta Ballet, passed on to her daughter a passion for dance and the arts, which Jean took to heart. Her mother enrolled 3 year-old Jean in the ballet program for children at Atlanta Ballet (called the Atlanta Civic Ballet at the time) and closely monitored her training. By the age of 19, while already an accomplished dancer herself, Jean decided to devote her life to teaching children – something she’d always had a knack for doing. Instilled with a love of the arts from her mother and a strong entrepreneurial spirit from her father, Jean’s enthusiasm and determination propelled her into this new venture with fervor. 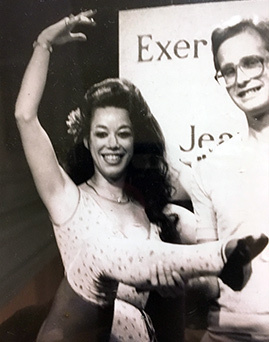 Her father, a successful Atlanta businessman, offered space in a his warehouse for Jean to hold her dance classes and she was off and running, soon finding herself with over 100 students. To say her long list of credits is impressive would be an understatement. Jean is the founder and director of the Georgia Tech Ballet Club, the owner of the Little Miss Georgia Pageant, and for several years hosted her own award-winning cable television program, Exercise and Health. She is listed in Who’s Who in American Education, and has won the Golden Peach Award as Best Teacher in Atlanta, to name only a few of her awards and accolades. She and her dance recitals have been a popular annual fixture at the Gwinnett Civic Center since its opening. Incredibly, after 40 years of teaching experience, this one-woman dynamo still personally teaches classes daily in both ballet and tap, demonstrating the same grace and skill she’s always had. And she continues to work in her father’s manufacturing plant in Scottdale, a family-owned business for over 100 years now. Jean Shapiro on the set of her award-winning cable series, Exercise and Health. I will be dancing as long as I can, no retirement. I love working with children and giving them a joy in life through dance. Ms. Shapiro’s Dance & Arts Showcase offers an assortment of arts and education classes for most children, teens and adults alike. Ballet continues to be the most popular, but students can also enroll in tap, jazz, and ballroom dance, piano, voice and violin. Article published by Elizabeth Rice for the Tucker Times newspaper in January, 2008. Minor edits by the webmaster.